Luxxis options claims to be a broker and an investment advisor. They say they can help you to make money with catching stories like “$10,000 overnight” by one of their clients. Should you invest your money with Luxxis Options? Certainly not! 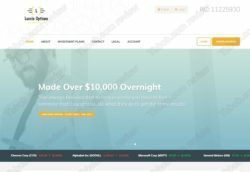 The Luxxis Options’ website is full of lies that prove that this broker is a scam. Luxxis Options allegedly was recognized among the best online brokers by Barron’s and among the best trading platforms by Stockbrokers.com in 2016. The problem is that Luxxis Options did not exist in 2016, it was founded at the end of 2017, check our picture to see the proof. There is a section with testimonials on the Luxxis Options website with stories of people that allegedly are very satisfied with this broker. But these reviews are fake. As you can see on our picture, they were fabricated with stock photos. These people are not real clients of the company. Luxxis Options claims to be regulated, it allegedly is registered with the SEC in the United States. But it is not true. We checked it with FINRA and this broker is not registered. There is no Fina Capital Advisors Corporation, this company does not even exist. Luxxis Options is a scam broker, it is not regulated. Stay away from it, your money would be at great risk with this company. If you want to trade financial markets, start on a free demo account with a regulated broker. Practice until you learn to trade profitably and understand the risks. Only then you can start trading with real money.